This unusual and interesting name is of early medieval English origin, derived from the Middle English 'more', moor, fen, a development of the Old English pre 7th Century 'mor', with the fused prefix 'a(tte)', at or by. 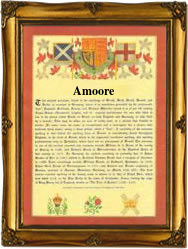 Amoore and its variant forms Moore, Moor and Atmore are topographical surnames, originally used to describe someone who lived on a moor or in a marsh or fen. Topographical names were among the earliest surnames to be adopted, since both natural and man-made features in the landscape provided easily recognisable distinguishing names in the small communities of the Middle Ages. The surname is particularly well recorded in Sussex church registers: the marriage of Thomas Amoore and Alice Regat was recorded at Wivelsfield on November 1st 1579, and one Margaret Amoore was christened at Barcombe on July 21st 1583. The first recorded spelling of the family name is shown to be that of William Amoore, which was dated 1479, Archaeological Records of Suffolk, during the reign of King Edward 1V, 'The Self-Proclaimed King', 1461-1483. Surnames became necessary when governments introduced personal taxation. In England this was known as Poll Tax. Throughout the centuries, surnames in every country have continued to "develop" often leading to astonishing variants of the original spelling.